Buy Samarium Cobalt (Rare Earth) Magnets on-line today! 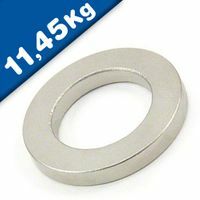 Our Magnet-Shop carries a large inventory of samarium cobalt (SmCo) disc magnets, available in a wide range of sizes. Samarium cobalt (SmCo) magnets are the most advanced, high-strength, permanent magnet material available today. Samarium cobalt magnets are commonly used in applications involving high or very low temperatures, where magnetic stability is critical. SmCo magnets are ideal for applications where space is a limiting factor, and high magnetic strength is required. 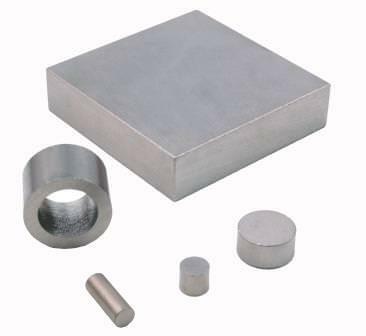 Samarium Cobalt rare earth magnets are often used in high temperature applications needing high magnetic performance and where magnetic stability over a wide range of temperatures is important. Dura can help optimize performance and cost with SmCo magnets in grades from 16 to 32 MGOe and temperatures up to 350°C/662°F. Stock Samarium Cobalt magnets also available to reduce development and production lead times. Many grades of Samarium Cobalt magnets exist to support a variety of industrial applications. The range of SmCo magnet grades typically extends from 16 MGOe to 32 MGOe. This range allows for optimizing cost, performance, and operational temperature resistance. Samarium Cobalt magnets exhibit good corrosion resistance when compared to Neo magnets. For most applications a coating or plating is not required, but it should be considered when operating in environments that are acidic, have high moisture, or are in a vacuum. Coatings and metal platings can be applied to increase the ability to clean the magnet. A metal plating will allow for greater cleanliness for vacuum and medical applications. Nickel plating can be applied to facilitate soldering the magnet, and this is especially used for adhesion to a printed circuit board. Low environmental reactivity makes Samarium Cobalt magnets good candidates for Medical and Aerospace applications. It is always advisable to empirically evaluate the magnet alloy in the operational environment before deciding on a design path. Typically, Samarium Cobalt magnets used in Medical applications will be parylene coating in addition to being clad in an application appropriate material. 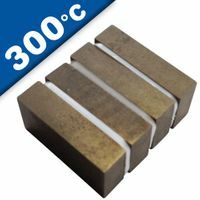 Samarium Cobalt magnets can operate at temperatures up to 500F (260C), making these rare earth magnets ideal for high heat applications. Sintered Samarium Cobalt rare earth magnets are extremely resistant to demagnetization and can operate at temperatures up to 500F (260C). There are many Samarium Cobalt grades which can withstand higher temperatures, but several factors will dictate the overall performance of the Samarium Cobalt rare earth magnet. One of the most pertinent variables is the geometry of the magnet or magnetic circuit. Samarium Cobalt magnets, which are relatively thin compared to their pole cross-section (Magnetic Length / Pole Area), will demagnetize easier than Samarium Cobalt magnets which are thick. Magnetic geometries utilizing backing plates, yokes, or return path structures will respond better to increased temperatures. The maximum recommended operating temperatures listed on the Samarium Cobalt magnetic characteristics page do not take into account all geometry conditions. Please contact a Magnosphere team member for Samarium Cobalt rare earth magnet design assistance when elevated temperatures are involved in your application. Most useful commercial magnets are anisotropic which means that they have an “Easy” or preferred direction of magnetization and that an orientation field was applied during the compaction stage of the manufacturing process. It is essentially impossible to magnetize the resulting anisotropic magnet alloy other than in the Direction of Orientation; however, various pole configurations can be achieved without conflicting with the magnet material’s orientation. Samarium Cobalt magnets manufactured by Magnosphere are compliant with Intellectual Property Rights, Environmental Restrictions, and Conflict Mineral usage. Magnosphere stocks the most relevant magnet alloys which are applicable to DFARS. Magnosphere can design, fabricate, and provide finished magnets compliant with DFARS. The relevant magnet alloys are generally Alnico and Samarium Cobalt (SmCo). The DFARS clauses listed above specify what is considered a “Specialty Metal” and how it can legally be procured and supplied for pertinent government contracts. More specifically to Department of Defense (DOD) article acquisitions. The clauses also describe what is considered a “Specialty Metal” and how it may be incorporated into a down- stream product. Several magnetic alloys fall under the classification of a “Specialty Metal.” The most commercially relevant are Samarium Cobalt (SmCo) and Aluminum Nickel Cobalt (AlNiCo), but lesser used alloys can also fall under the Specialty Metals clauses. The best way to mitigate risk is to ascertain if the magnet alloy contains Nickel or Cobalt and determine if the concentrations of these metals are sufficient to classify the magnet alloy as a Specialty Metal. Samarium Cobalt Magnets are very strong and brittle, and appropriate handling and packing is required. Most receiving departments are not familiar with the strength of Samarium Cobalt magnets and this can result in injury or broken parts. 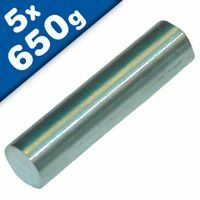 All personnel that may come in contact with this alloy should be made aware of the dangers of handling these magnets. The brittle nature of the alloy can lead to flying chips if the magnets are allowed to impact each other or a solid surface. Larger magnets can become a pinching hazard if caution is not exercised. We urge all customers to discuss handling techniques pertinent to their magnets with a Magnosphere team member. Fully dense Samarium Cobalt rare earth magnets are usually manufactured by a powdered metallurgical process. Micron size Samarium Cobalt powder is produced and then compacted in a rigid steel mold. The steel molds produce shapes similar to the final product, but the mechanical properties of the alloy usually inhibit complex features at this stage of the manufacturing process. The Samarium Cobalt’s magnetic performance is optimized by applying a magnetic field during the pressing operation. This applied field imparts a preferred direction of magnetization, or orientation, to the Samarium Cobalt magnet alloy. The alignment of particles results in an anisotropic alloy and vastly improves the residual induction (Br) and other magnetic characteristics of the finished magnet. Who supplies high quality Supermagnets, Samarium Cobalt Magnets? Magnosphere offers best priced Samarium cobalt magnets globally to all industries, including Automotive, Aerospace, Military, Advertising, Design House, Electronic and Academic/R&D. Please inquire for custom Neodymium magnets or magnetic assembly. 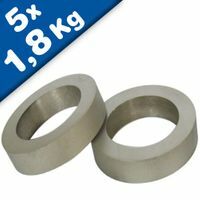 Buy Samarium cobalt Magnets at Magnosphere and get a better deal!